Services and Projects "Airmarking" name, elevation and runway numbers of local airport taxiways. Annual Scholarships. Compiling a history of Sedona area women pilots. Description: Members at 2009 Xmas party at Jan Thompson's Hangar in Cottonwood. All Women Pilots! Description: Hass Maxson, Lois Neville, Jean McConnell, Barbara Vickers, Kathy Eaton, Beverly Wilkinson (standing) and Julie Millis (President) and June Kaiser (seated) at a 99s meeting, july, 2007 at Julie Millis' home. "Plane Cooking - Good Things from the Kitches of Pilots on the Go-Around"
Description: Plane Cooking - the Sedona Red Rockettes cookbook being sold to raise funds for our flight scholarships. Description: Nell and Beverly were both WASPs (Women's Air Force Service Pilots) in World War 2. We are honored to have them as members of the Sedona Red Rockettes. 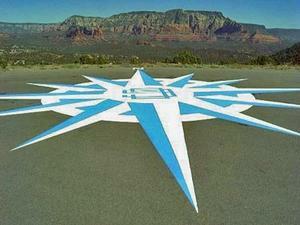 Description: For many years in the early 1990s, the Sedona 99s held a "Hangar Sale" (version of a yard sale) in Barbara Vickers' hangar at the Sedona Airport to raise funds for their flight scholarships. Description: Sedona 99s visited Louise Hicks' gold mine near Wickenburg in October '08.